Box Text: RISE ABOVE THE PEONS! 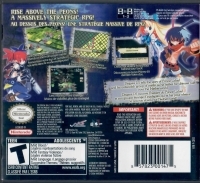 Disgaea DS tells the story of Prince Laharl and his outlandish group of misfits as he battles for ultimate rule over the Netherworld. • Gratify your ego and humiliate your friends on the multi-player mode! • See all the action from the eyes of an Overlord. • Check out what a Prinny says behind you back. • Less visibility, more strategy. 01-19-2016 silverbow Box Text RISE ABOVE THE PEONS! A MASSIVELY STRATEGIC RPG! 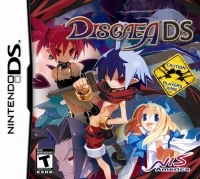 Disgaea DS tells the story of Prince Laharl and his outlandish group of misfits as he battles for ultimate rule over the Netherworld. • Gratify your ego and humiliate your friends on the multi-player mode! • See all the action from the eyes of an Overlord. • Check out what a Prinny says behind you back. • Less visibility, more strategy. 01-31-2015 puddingm Box Text RISE ABOVE THE PEONS! A MASSIVELY STRATEGIC RPG! 05-13-2012 disgaeniac Box Text RISE ABOVE THE PEONS! A MASSIVELY STRATEGIC RPG! This is a list of VGCollect users who have Disgaea DS in their Collection. 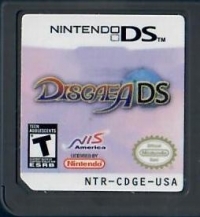 This is a list of VGCollect users who have Disgaea DS in their Sell List. This is a list of VGCollect users who have Disgaea DS in their Wish List.